The Psalmist very clearly tells us that God wants us to bring before him our joy no matter how terrible it sounds. He uses the word “noise” which is clearly defined as a sound, especially one that is loud and unpleasant and causes a disturbance. By that definition we should all be plugging our ears and running from our church sanctuaries on a regular basis. The point of the passage is that God created us to worship Him, and when we do so through song it’s really more about where our heart is than when our musical preference lies. As part of my desire to show my children that music is about the connection we have with our Creator I began incorporating some different song selections into their bedtime routine. 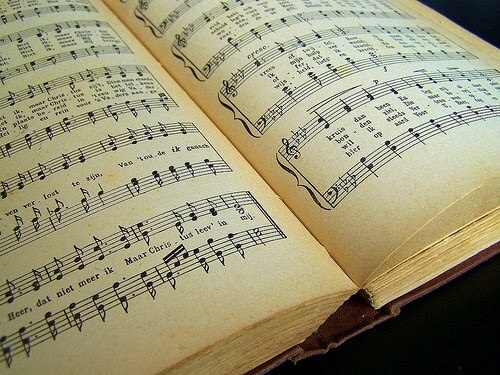 I pulled out my mom’s old hymnal and selected a song or two to sing to them occasionally when I tuck them in. The funny thing is, they LOVE it. They all love music and we have a variety of musical genres on our devices but it didn’t occur to me that one day they’d actually be asking me to sing them a song “from the green book” before drifting off to sleep. Now let’s be clear that I am not advocating a revival of the clunky, small-print books gracing the pews of our churches. What I am suggesting, is that much like the stories of the worship choruses we change up faster than we learn them on Sunday mornings, our “oldie, but goodie” hymns have a story that inspire our hearts to closer fellowship with God. I vividly remember as a child attending a funeral of one of my dad’s relatives in Grande Prairie, Alberta. I have no recollection of who the relative was, what the weather was like, or who I met that day but I do remember belting out the hymn “How Great Thou Art”. The gathered mourners began to sing this hymn, a favorite of the recently departed, and as the swells of melodic voices came to “….I see the stars, I hear the rolling thunder…” a great clap of thunder echoed outside the building. I will never in my life forget that moment. I’ve never talked to my parents about it, it just happened. Perhaps I fear them recalling that nothing of the sort actually happened and my love of that song, and others like it would somehow be diminished. Despite the possibility of my memory being incorrect I do remain enthralled by the stories many of them tell. The stories that inspired the writing of such deep, loving words, but also the stories that unfold as you enter the musical realm. When I sing hymns like “Crown Him with many Crowns”, “The Love of God”, “Amazing Grace”, or “It is Well with my Soul” I hear the story of my life unfold before me. I see the disgrace and shame of my sin, the sacrifice of my Savior, the rescue of my undeserving soul and feel the glory of finally seeing my Creator face to face and my heart is full of love and joy and peace. These beautiful melodies evoke in me the same response as Avalon’s, “You Were There”, Chris Tomlin’s, “Our God”, Fee’s, “We Crown You”, or Jesus Culture’s, “Waiting Here for You”. As I listen to the lyrics and allow the melodies to quietly invade my heart, what I KNOW is that the purpose of music is for us to express our joy in the gift of salvation and to present our hearts as a sacrifice. When we enter into a place of worship, regardless of how others are impacted, we open our hearts to allow the Holy Spirit freedom to fill us. Does that mean our enjoyment of the previously “unpleasant” noise immediately changes? Not particularly. I still find myself cringing when I hear certain songs or styles of music but I’ve chosen a different response. Instead of folding my arms and impatiently waiting to get to the songs I love, I open my eyes and glance around the room at those who are completely enraptured by the movement of the Holy Spirit in their hearts because the “noise” has opened their hearts and turned their ears toward Him!